The stage is set for enterprise competitive success with respect to how fast valuable data assets can be consumed and analyzed to yield important business insights. Technologies such as artificial intelligence (AI) and deep learning (DL) are facilitating this strategy, and the increased efficiency of these learning systems can define the extent of an organization’s competitive advantage. By all indications, this is an industry on an upward trajectory, but limiting factors such as data storage and networking bottlenecks must be addressed to assure the maximum benefit from AI and DL applications. As such, new data platforms for artificial intelligence are popping up throughout the industry. Enterprise machine learning algorithms have historically been implemented using traditional compute architectures, where system throughput and data access latencies are measured by paring compute and storage resources through the same network interconnections that serve other business applications. With AI and DL, the increasing volume and velocity of arriving data are stressing these legacy architectures. In this technology guide, we’ll see how current implementations for AI and DL applications can be deployed using new storage architectures and protocols specifically designed to deliver data with high-throughput, low-latency and maximum concurrency. 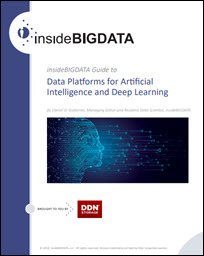 The target audience for the guide is enterprise thought leaders and decision makers who understand that enterprise information is being amassed like never before and that data platforms for artificial intelligence and deep learning act as both enablers and accelerators for business innovation.